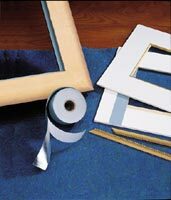 Pressure-sensitive and specifically designed to seal backing board to frames, this long-lasting tape conforms well to irregular or rough surfaces. A popular custom picture framing item in Oak Park. It has a blue-gray color, foil backing and non-yellowing formulation, plus a permanent acrylic adhesive that can be removed with mineral spirits. Not for direct application onto artwork. Size: 1-1/4" x 1000".